from Italian Easy: Recipes from the London River Cafe, p. 96. Last night I passed such an enjoyable evening that the experience has become a new standard of what makes for me a very good dinner party: two gracious, lively, and experienced hosts; great food served without fuss; lots of good wine; four friends who listen as easily as they talk; and lots of laughter punctuating interesting tabletalk. After we’d been at table a while and finished our dessert, my dinner companion to the right of me gasped when he looked at his watch. 11:30! How did it get that late? I, for one, am never up that late, so I really must have been enjoying myself. So, tonight I decided to cook something quick and light. I managed the quick. And this dish is certainly light, but not in the way I meant — light on calories. Oh, but it’s good. And hard to improve on. Still, I’ll tweak it to accommodate a serving for one. Melt half the butter in a thick-bottomed pan. Add the garlic and rosemary and cook for a minute. Add half the radicchio and prosciutto. Cook just to wilt. Remove from the heat. Cook the tagliatelle in boiling salted water until al dente, then drain. Add the rest of the butter and half the Parmesan. Put into the cooked radicchio, then stir in the remaining radicchio and prosciutto. Toss thoroughly and serve with Parmesan. Am I such a literal person that I think this recipe is not written as well as it might have been? I think for inexperienced cooks a few more direct objects in the last paragraph might have been more helpful. The timing of the pasta water needs adjustment as well. Before you do anything else, preheat your oven to 200 and put the plate you will eat the pasta out of in the oven to warm. I’ve decided this makes a big difference to any dish, but this one especially so. I followed the instructions — except that I started a pot of water, salted as usual with kosher salt, on the stovetop. It’s easier to keep water at a simmer than it is to keep food warm and in the perfect cooked state. Then I chopped up everything before hand. Be careful of the rosemary. Trust Gray and Rogers and tolerate a stronger taste of rosemary in the cooking stage than you might otherwise prefer. If you follow their proportions (in other words, halve the amount for this version), the pasta mixed with the vegetables will tame the strong flavor of the herb. 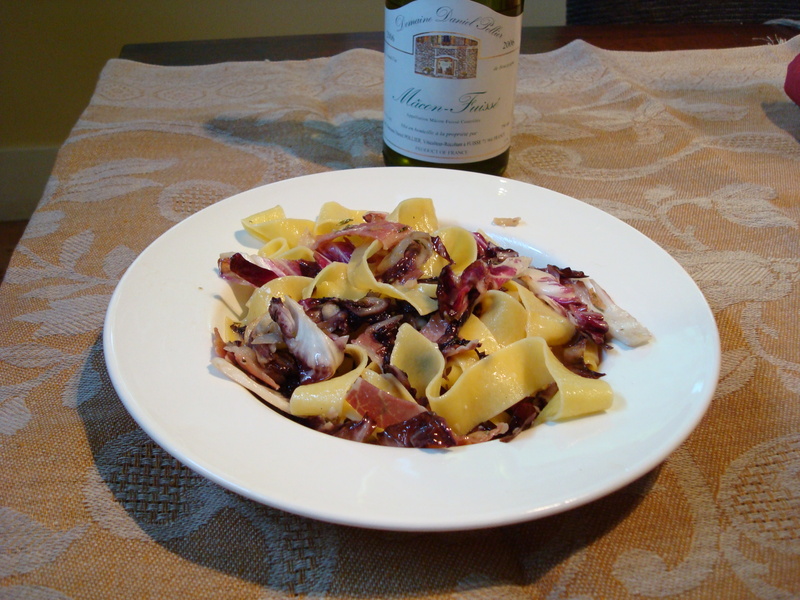 Their instructions to cut the prosciutto and radicchio into ribbons the width of the noodles matters. I don’t know why, but now that I’ve done this recipe a few times I believe that it really makes a difference. With regard to texture and visual impact, It contributes to the balance of the dish overall, I suppose. I find it hard to say how much butter I used. Try to judge how much to use in this way. Eyeball the radicchio and prosciutto. If you cut the proportions in half, I think the amount of butter will still be unnecessarily generous. So, I would start with a quarter of a stick. When you add the radicchio and prosciutto, judge for yourself if there is enough fat to sauté adequately what you’ve put in the pan. My rule of thumb is to halve the amount of butter a recipe like this calls for and then throw in a touch more to be decadent and to err on the right side of flavor. Gray and Rogers instruct you to put only half of the radicchio (but all of the prosciutto). I put in more than half. I anticipated not wanting quite so much crunch in my vegetables as they seemed to think advisable. I sautéed it all much past the point of wilted. Notice that they do not call for salt and pepper. If your prosciutto is good, meaning not particularly salty, you’ll need a pinch of kosher salt at the end and god knows how much more at table. Do not remove the sautéed vegetables and prosciutto from the heat. Turn the heat to its minimum instead. If the pasta will be done soon, toss in the rest of the radicchio at this point. There’s no point in its being completely raw when added to the pasta. I don’t believe hot pasta will render softer, so add it now and let it sit until you’ve drain the pasta. By this time, you should have put in your tagliatelle. Normally, I confine myself to 4 ounces of dried pasta. 3 ounces will do fine here for one person. There’s a lot of substance to this dish. Cook the pasta according to instructions. If I had felt more energetic, I would have rolled out a batch of my own dought, but Di Cecco egg tagliatelle worked very well. Scoop out some pasta water before you drain the noodles. It will help in moistening the dish. Drain the pasta, add more butter and the remaining grated Parmesan to the hot noodles still slightly dripping wet. (I’ve just supplied the direct objects that I felt were missing in the instructions.) Combine. Now add all the radicchio and prosciutto on top and toss well with more Parmesan. If it looks too dry, try adding a bit of the pasta water you set aside. But only a little. This shouldn’t be a saucy dish. Salt and pepper. Serve right away. Looking back, I see that my comments on this recipe are more than half again as long as the original recipe. Hmm. Is that me or is that the recipe? In any case, depending on the prosciutto you buy (prosciutto di Parma is best), this recipe is underseasoned. But really good. Don’t be stingy on the butter. The depth of flavor comes from that fat. And 3 ounces of pasta is really all one person needs in this case. I have fully embraced the strategy of overwhelming pasta with vegetable-based sauces — not meat sauces like Bolognese. Any pasta that is served with fresh seasoned vegetables can stand being submerged under those flavors.